The answer to this question depends entirely on what size keg you’re buying (shocker!). This is what most people know as “a keg,” but the half barrel name throws them off. One of these has 15.5 gallons of beer in it. That means you can get 165 12 oz. beers from it, or 124 16 oz. beers. If for some bizarre reason you’re buying a keg to fill growlers, you can fill 31 of them (of the standard 64 oz. variety) with a half barrel before you’ll run out of beer. 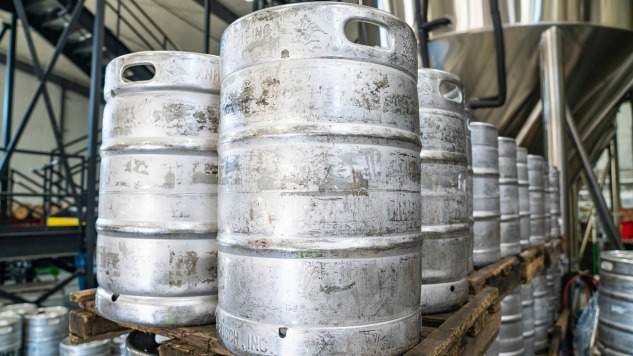 Quarter Barrel kegs are the second most common type of keg. These come in two different forms: a tall keg (the same height as the half barrel) but half the girth, and a size that maintains the same girth but cuts the height in half. These are also known as pony kegs and tall quarter kegs. With these, you get half of what you would get from a half barrel. That means each one has 7.75 gallons of beer inside, which equates to 82 12 oz. beers, 62 16 oz. beers, and 15.5 growlers. You’re not going to see these around too much, but a sixth barrel (also called a sixtel) holds 5.16 gallons of beer. That equates to 56 12oz beers and 42 16oz beers. These 5-gallon kegs are typically used by home brewers, but you occasionally see a few breweries offering them for customers as well. The smallest of the bunch, a Cornelius Keg or “Corny” holds 5 gallons of beer, which equates to 53 12 oz. beers, 40 16 oz. beers, and 10 64 oz. growlers. How Much Beer Do I Need? That’s a good question. Can you ever have too much beer? Yes. The answer is yes. Determining how much beer you need, however, is a pretty simple process. I typically tell people to go by this simple formula, which so far has done me well. If you’re only serving beer, plan on each person you’ve invited drinking one beer for every hour of the event. Sure, some people will only have one, but then there’s also that guy who will have seven during your three-hour wedding reception. The one beer per person per hour formula will ensure you have a reasonable amount of beer to keep everyone lubricated without having a massive amount leftover when everyone heads home. If you’re serving something other than beer at your event as well, then chances are good that people are going to drink that as well. For those type events, I typically suggest people buy enough that each person can have one beer for every two hours of the event. Know your crowd though. If you’re having a big super bowl party with your college buddies, then you might want to dial that beer number up. If you’re getting together with a bunch of wine enthusiasts, then you probably need to dial up your wine game rather than buying a ton of beer. One of the worst things you can do is dramatically overbuy beer in keg form. Unless you have a kegerator, once you tap your keg you essentially start a timer on how long it’s going to stay good. That timeline moves even faster when you put that beer in a bucket full of ice that starts melting and your beer starts getting warm. If you’re having a big party, definitely get a keg if you want one. You’d be better served, however, to buy a smaller keg in some cases than you need, and then supplementing that keg with a case or two of cans and bottles. Start with the keg, but if it runs out while the party is still going on, you can pull out the bottles or cans and keep things going. If you end up not needing the bottles, they’ll last a lot longer than that massive keg would.